RAWALPINDI: The Pakistan International Airlines (PIA) has launched a new system for ticket reservation. The national flag carrier on Wednesday began using the services provided by a Turkish company, the Hitit Computer Services, after switching over from a decades-old system. According to a PIA press release, the salient feature of the new IT system is the efficiency with which its website operates, making online booking easy and fast. PIA Chairman and Chief Executive Officer Saqib Aziz said his organisation`s new IT partner would bring in latest technologies and provide conveni-ence to customers. He said every possible effort had been made to make the transition from the old to new system glitch-free and that he had instructed PIA teams to make themselves available round the clock for a smooth and swif t switch-over. Under the new system, the airline`s staf f will use Hitit`s Crane Solutions for reservations, inventory control, ticketing and check-in procedures, flight operations, scheduling, revenue management and accounting and crew management. The airline has requested its passengers for cooperation in case of any inconvenience during and af ter the transition that is expected to last a few days. They have been requested to contact the PIA call centre in case of problems. LAHORE: Pakistan International Airlines’ (PIA) international flight bookings have almost ceased, resulting in potential revenue loses, owing to the national carrier switching over to Hitit, a relatively unknown distribution system operated by a small Turkish software house, on September 12. Previously, PIA was using Sabre, a Global Distribution System (GDS) it had switched over to in 1998, from its own REPAK system then linked to over 550 travel agents. Keeping the peak December season in view, failure in smooth migration to the system is likely to cause colossal revenue losses, amounting to billions of rupees. According to former PIA DMD Dr Shah, PIA’s local sales have dwindled from Rs8.5 billion to Rs5.5 billion as travel agents have doubts regarding PIA’s ability to secure the record of their bookings, and have hence switched to other airlines. The Hitit system currently caters to few low-cost airlines in Turkey and Africa and none of the majors including the Turkish Airlines is using it. According to an independent aviation expert, Malik Tariq Ali, “migration from Sabre to Hitit should have been smooth, ensuring in-house training of departments and travel agents, integration of other systems and transfer of passenger and booking data to the new system”. The current switchover by PIA in haste from Sabre – hosting its booking data and Passenger Service System (PSS) for the past 16 years – is likely to create innumerable glitches for the national airline. “The management should have adopted recommended migration procedures and ensured the availability and transfer of all passenger bookings data for the past 365 days to the new system. Problems are likely to occur in securing record of passenger bookings during changeover, which will force travel agents to book on other airlines, further reducing the already declining PIA revenues. If it were not for the federal government dole-outs, it may not have remained afloat” says Malik Tariq Ali. Sabre IT and consultancy agreement was initially signed in 1998 on the directives of the former PIA chairman Shahid Khaqan Abbasi, subsequently former prime minister who also happens to own Air Blue, for a 10-year term at a cost of approximately $1 million per annum, replacing REPAK which cost less than one-third. The agreement was terminated by the Musharraf regime without any prior notice. Sabre challenged the termination in the UK and PIA hired the legal services of Aziz A Munshi, who advised them to opt for an out of court settlement with heavy penalties. PIA renegotiated the agreement for a 3-year term in 2002, under which the airline paid for using individual systems. In 2009, former MD Aijaz Haroon revised the agreement for a 10-year term, which included reservation, check-in, flight operations, schedule and network planning, revenue accounting, revenue management and loyalty. However, PIA has failed to utilise Sabre to the optimum. Instead, PIA’s procurement of essential spare parts was changed from industry recommended list of various vendors to a single unknown vendor, Transworld Aviation Fze located in Dubai in 2011, leading to disruption of schedules and ultimately the grounding of half the fleet. A similar incident took place during the tenure of Ahmed Saeed and Tariq Kirmani who appointed a single vendor located in the UK, resulting in the imposition of sanctions by the European Union (EU) regulators on almost half of the PIA fleet. PIA was presently paying $7 to $8 million per annum because of the one-sided agreement with Sabre, while not utilizing the system to its optimum capacity. According to industry sources, PIA’s electronic revenue constitutes only 20 percent of its overall sales. The Sabre deal would have been beneficial only if the electronic sales were in the range of 75 to 80 percent. This criminal negligence by design failed to curtail serious revenue pilferage. Profit tried to reach out to PIA officials to get their version regarding the matter, but until the time of filing, there was no response. PIA apologizes to passengers facing inconvenience at Islamabad Airport. Departure of a number of PIA flights delayed at Islamabad Airport due to some issues with new Hitit system introduced by the airline, according to news sources. PIA continues experiencing problem with Hitit system including issuance of boarding pass, according to news sources. Manually issued boarding pass for September 14 PIA Lahore to Karachi flight PK-305. PIA Airbus A320 registration AP-BLY departed from Lahore at 11:33 PM as PK-305 with a delay of more than five hours. The flight was scheduled to depart at 6:00 PM. AP-BLY had arrived in Lahore at 9:12 PM as flight PK-204 from Dubai with a delay of more than four hours. PK-204 was scheduled to land at Lahore at 4:40 PM. Chairman PIA Saqib Aziz also visited Islamabad Airport to review Hitit system. The new system is also showing incorrect fares, according to news channels. 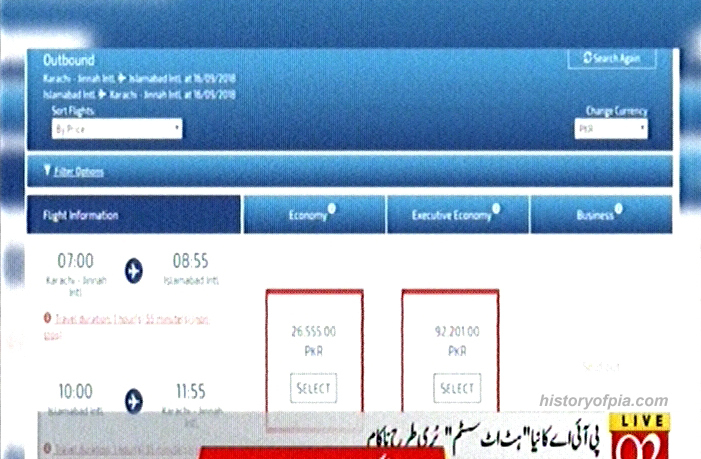 PKR 92,201 shown as Executive Economy fare for Karachi to Islamabad flight. 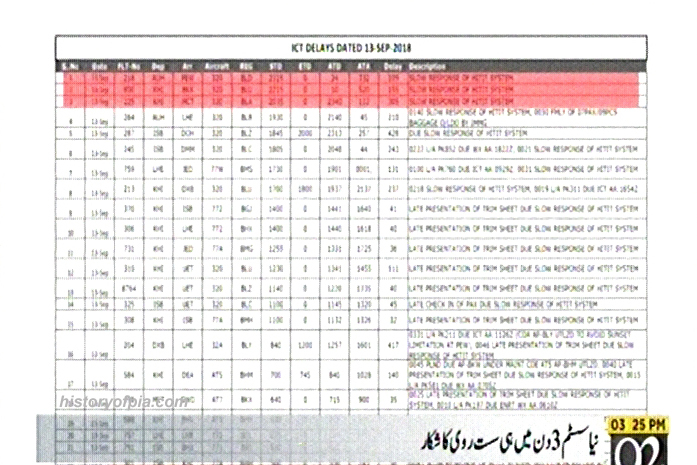 Some of PIA flights delayed on September 13 due to slow Hitit system. The booking system is not user friendly at all. There is no visibility of flights costs for days either side of those selected. Trying to book a ticket for my dad with a domestic stop but the new reservation system does not allow this. Called PIA contact centre who said they are updating the system but unsure if I would be able to book a ticket with multi stop over. Europe bound flights got direct hit from this crisis. Average delay is 3 plus hours. Last edited by BJ911 on Sat Sep 15, 2018 6:14 pm, edited 1 time in total. Situation is improving now. Effective steps taken by management is bringing fruit. Todays knock-on delay will be passed on to upcoming flights which can be absorbed in one or two days. Hitit starts working and electronic boarding cards issued. Hope for the Best. According to news sources, PIA staff is helpless and passengers facing inconvenience in London, Manchester and Birmingham due to issues with airline's new Hitit system. The airline's new reservation system is working alright and normally. PIA has formed teams to resolve any issue with the new system experienced by the airline's clients. PIA booking offices and travel agents linked to the airline are selling tickets through the new system across the world. Online bookings have increased since the introduction of the new system. Hititi says migration is successful. It's a good news for PIA. 1) Terminates Loss making JFK flights. 2) Getting away from Sabre. New PIA CEO's message about Hitit. Lahore, September 22, 2018: The new reservation system HITIT will bring savings of almost 50 % as compared with the previous one, this was stated by Chairman & CEO PIA, Mr. Saqib Aziz during his visit to PIA facilities at Allama Iqbal International Airport Lahore. He said that all PIA employees have to work collectively for the betterment of the airline with sincere dedication. He said that everyone should work an extra mile in bringing PIA out of the financial losses and that the new reservation and departure system implemented is part of the strategy to reduce losses and increase revenues. He said that it was now for the employees to put in their efforts for bringing improvements and increase efficiencies. PIA district Manager Lahore, Mr. Umar Nawaz Goraya and PIA Station Manager Lahore, Mr. Amir Malik briefed Chairman PIA during his visit. Earlier, Saqib Aziz met with CAA Officials at Lahore Airport and instructed them to provide best services to the passengers. CAA Manager, Sardar Sikandar apprised Saqib Aziz about the working and performance of CAA at Lahore airport. RAHIM YAR KHAN: Passengers of a Lahore-bound Pakistan International Airlines (PIA) flight protested and allegedly quarrelled with the PIA staff at the Shailch Zayed International Airport on Tuesday as newly introduced bool(ing software continued creating problems for both the staff as well as the passengers. A similar incident had happened last Tuesday involving the passengers of the Lahore-bound flight but the PIA authorities did not resolve the issue despite the passage of a week. A passenger, Ehtsham Akram, got ticket (No.2142992184001) for PK-582 on Sept 15, but when he reached the airport on Tuesday, he was told that the flight was going to Islamabad instead of Lahore. Manyother Lahore-bound passengers faced the same situation. They got frustrated and started quarrelling with the PIA staff. At last, six passengers could get their boarding passes for travelling to Islamabad in 48 seat ATR plane. A PIA source told this correspondent the PIA had switched to its new booking software `Hitit computer system` two weeks bacl(. Due to the new system, the PIA staff and authorised travel agents were facing many difficulties, he said and asked if there was a flight number for specific destination why the same software was generating tickets of another destination with same flight number. According to him, there were many technical flaws in the switchover from 17-year-old software to `Hitit system`. A PIA official at the district headquarters confirmed the quarrel between the passengers and the airport staff on Tuesday, saying that he had sent a detailed mail to thePIA headquarters in this regard. He said `Hitit software` was functional since Sept 12, 2018. Five passengers for Lahore were returned from the Rahim Yar Khan airport last Tuesday. However, he had information about only one such passenger today. PIA spokesperson Mashood Tajwar told Dawn the main cause of the issue in the new software was lack of training of the PIA staff. He said the `Hitit software` would be properly functional very soon. The confusion about flights, their destinations and fare would be cleared within a week, he said. In the initial days, he said, some glitches were expecte d in every new system and it was natural to have some issues due to the huge data transfer and integration. However, he added, the issues were being resolved and more and more people were being trained.PIA headquarters in this regard. He said `Hitit software` was functional since Sept 12, 2018. Five passengers for Lahore were returned from the Rahim Yar Khan airport last Tuesday. However, he had information about only one such passenger today. However, he added, the issues were being resolved and more and more people were being trained.